I’m sure there are tons of reviews of this film out there already – written by smart people with a deep knowledge of both Jackie Chan and martial arts cinema in general, with all sorts of information about the evolving style and the one-martial-art-vs-another undercurrent that seems to feature in so many of these films. 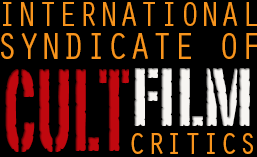 But for this one, you’re just going to get the socialist film nerd’s approach…which is probably not original either. But it’s free, so stop complaining! 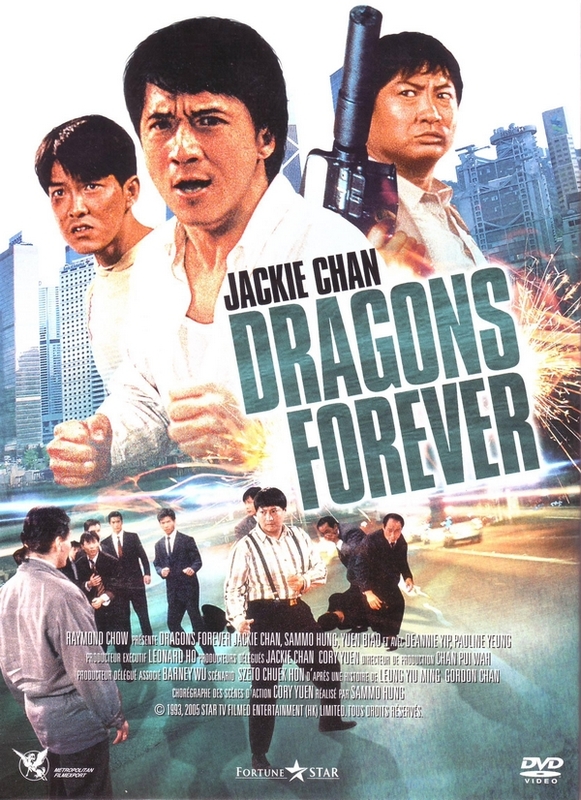 Jackie Chan, Sammo Hung and Yuen Biao (the three stars of this film) were all brought up in one of the many Peking Opera Schools, among the last generation to do so. The kids were trained from an incredibly young age in dance, acrobatics and martial arts, and paid off the training “debt” by public performance. This was pretty brutal (Chan’s autobiography goes into some detail on this) but for those who succeeded, they could make a career out of it afterwards – and that’s what happened for the three famous graduates, who started at the school at the same time. The plot to this one is pretty irrelevant, to be honest, as it’s just a hook to hang Three Stooges-level slapstick and insanely complicated fight sequences on. A woman’s fish farm is being threatened by pollution from a nearby industrial laundry (which, it turns out, is a front for a heroin production plant, a twist that any fan of “Breaking Bad” will have spotted) and Jackie is the bad guy’s lawyer. He employs mystical thief Yuen and conman Sammo to try and get the woman to both drop her lawsuit against the laundry, and sell them her farm – and eventually (but not til a really long way into the film) they realise whose side they should be on. There are two things to say about this film. First and foremost is the astonishingly backward portrayal of women, which starts with Jackie walking through the courthouse, sleazing women into going out with him while his secretary looks on longingly; continues through the fish farm owner and her friend discussing how you should pretty much say yes to any man because you might end up 40 and alone; and culminates with the two women forgiving Sammo and Jackie almost immediately when it’s revealed that they have been working for the violent criminal who’s trying to put them out of business. Oh, I almost forgot that Jackie’s girl (who is an expert witness for the fish farm) being forced by the judge, under oath, to say whether she loves Jackie or not. Now, I know banging on about this sort of thing says more about the relatively enlightened times we live in now than it does about then; but this film is so awful that it sticks out, even among the late 80s. While watching this and discussing it, my wife asked “so, this film is from the 1940s, right?” with not much irony. The second thing is the magnificent set pieces. There’s a reason I had it fixed in my head that this is my favourite Chan film, and it’s the incredible fight scenes that are dotted throughout. Chan is the best in the world at this sort of thing, with Hung and Biao not far behind, so the stunts are performed at an incredible pace with a degree of difficulty most other stars (or even their stuntmen) could only dream of. The closing fight, where Jackie and Yuen take on a drug plant full of guys, one of whom is Benny “The Jet” Urquidez, former world champion martial artist and looking extra-creepy here with heavy mascara, is just fantastic. Even with the technical advances made since 1988, and the arguably more impressive set-pieces (such as Tony Jaa taking on a nightclub full of guys in a single take), this is still an amazing technical achievement. 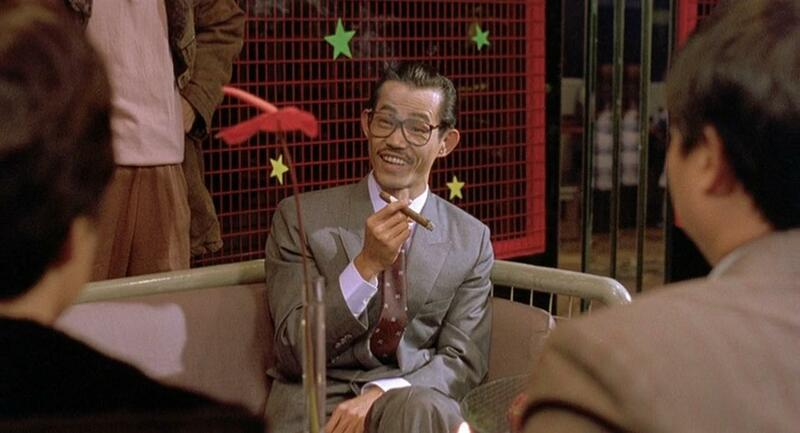 It wasn’t a hit at the time in the Far East (all three main guys played against type, and seeing Chan with a woman is a big no-no for his female fans, apparently), but it’s become more of a classic with the passing years – so this review is somewhere between those two poles. The reason it doesn’t work isn’t because they play different sorts of roles than we’re used to, it’s because the plot is stupid and it’s appallingly sexist; and while it deserves to be seen, it needs to be watched with a critical eye. Still, there aren’t many films that combine fighting and broad comedy with as much skill as this one does, so enjoy the incredible display, and the ludicrous comedy. 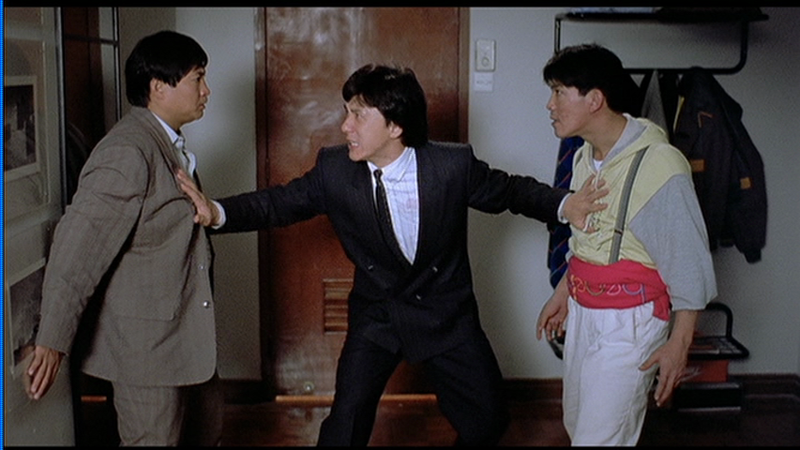 This entry was posted in Reviews and tagged Jackie Chan, martial arts, Sammo Hung, Yuen Biao. Bookmark the permalink.